since the horrible flu in the middle of last year, i fear coughing. because phlegm, ever since, always makes me run out of breath. don’t want another session with nebulizer. enough. 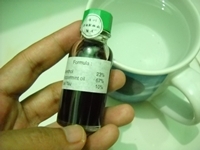 i almost drink cajuput oil when my hubby brings me this Four Season medicated oil. three to ten drops of it in a cup of tea or hot water and it’s ready to go. even the steam makes me high. bwehehehe. it’s good. 23% of menthol, 67% of peppermint oil, and 10% of Hak Yau (not sure what it is). but, really, i love Chinese herb for medication. somehow they work well. I have been usin four seasons medicated oil for a few years now & I have run out. I’m in Christchurch New Zealand where do I buy it from ? I live in Surabaya, East Java, Indonesia and it’s actually very easy to find the Four Season Med Oil on any Chinese herb store. Where did you get your supply of the oil all these years? Maybe you can go back there to see if they still have the stock? Really sorry I can’t help you with more detailed info on how to get the med oil around New Zealand. Hi Louise your query’s date was 5:13 pm 16th February 2011 – Just found it today @ 12:51PM 1st May 2016?…I was googgling “Hak Yau” which has 10% in the four seasons medicated oil ending up finding your question so if you haven’t got it yet, I know where to buy it in Auckland. I keep a few bottles at home and use it every week at home. Yg 40 ml eceran dan 1 box/lusin ? Maaf, mbak. Saya nggak jual medicated oil-nya. Cuma kebeneran nemu di apotek dan itu udah lama sekali, jadi lupa harganya berapa. So is it actually safe to drink??? I believe it is safe to drink. Tried it after reading the leaflet inside the package. True that. Although the taste could be very strong. It is a great remedy, and I love that it is herbal 🙂 Good to hear you are feeling better. The most amazing thing about this oil is it even attacks & kill the germs causing the most powerful pain inside your tooth. All you do is put one drop of it on top of your painful tooth and it will find it’s way quickly into the root of the tooth and kill the Germs and the Pain – I saved a couple of teeth from unnecessary extraction by this medication-FOUR SEASON MEDICATED OIL. I’m trying to start an International 4SEA MEDOIL Club for all users to join and be members. Send your name & email address to International 4SEA MED-OIL Healing Club to: musicandthearts@yahoo.co.nz cheers Eti Eves Auckland New Zealand. What is Hak Yau? No one knows… it is in an essential oil that is suppose to be for way too many things… unbelievable. It’s been about eight years since I started to use Four Season Medicated Oil when I was in Jakarta. I am from Sri Lanka. I often bought this whenever I travelled to Indonesia. I introduced this product in Sri Lanka and it has a very good reputation. I mostly used as an external application. We are Guangdong Yangcheng Health Pharmaceutical Co.,Ltd. we export Chinese herb many years.